Hello, my first step into planning and walking through designing a keycap set. I have been playing a bit of Quake 2 again lately and will probably continue with Quake 4 after that. In those games the great enemy are called Strogg and they are vicious corpse mutilating and assimilating cyborgs. If you watch Star Trek the Borg are similar but "less bloody". The keycap set I'm planning is mainly inspired by the Strogg and their home planet Stroggos as depicted in Quake 2. Currently, I've been working on the colorway, and will continue with more color setup tryouts and tuning. If there is enough interest I will continue to layouts and possible novelties. Novelties might come up thin, but I would really like a novelty key for the Strogg emblem (and yes I know the molds will cost a ton of money so might be a no-go anyway). Together these form my vision of Strogg as put in Quake 2. The turquoise keeps the set from becoming too monotonous, and the orange accents really work together with the turquoise in my opinion. I'm only worried the brown and turquoise resembles too much mint chocolate in some eyes. I wanted to incorporate the bloody nature of the Strogg via some red into the set, but it would become too busy I think. The Stroggos depiction in Quake 4 is cleaner a tad more vibrant, almost to the point of being a bit too busy and colorful (in my opinion). This set will follow Quake 2 Stroggos more to keep the source palette smaller. I want to do GMK, as the Strogg seem more GMK than DSA or SA for instance. The exact colors will be fine-tuned, depending on how well GMK can provide custom colors. If custom colors are not possible I'll have to see what to do about that. Let me know what you think. 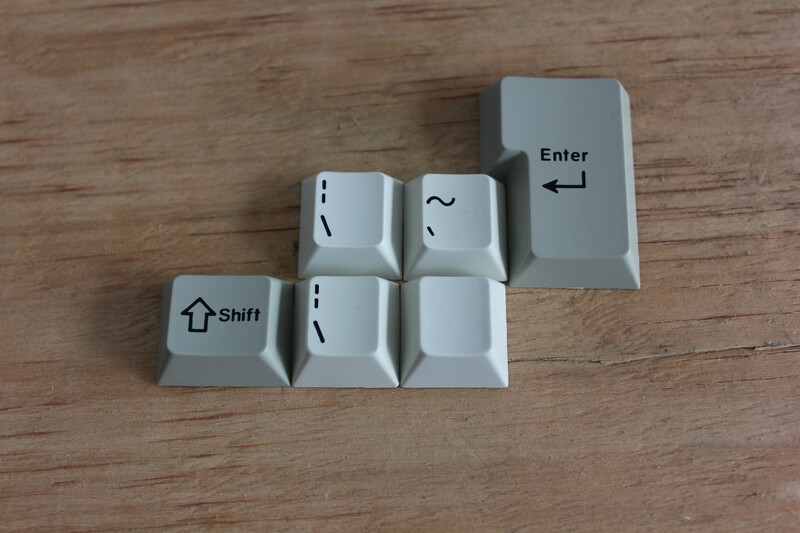 Again, this is my foray to designing a keycap set, so help and pointers are very welcome. If nothing else I can take this one as a lesson round in case not enough folks are interested. EDIT: Seems like Photoshop destroyed the colors on the embedded KLE render, will have to fix that ASAP. Looks awesome, I'm definitely interested. Yeah I'm currently trying out a version without the exploding spacebar, I'll post an update soon. Decided to let the colors be for now and started some layout work. Also removed the overly intrusive spacebar and replaced it with a dark gray variant to match the alphas. Still want to offer the turquoise spacebar as an option in a kit or something. The extra keys are modeled after a few popular GMK sets, but I might add more or remove some if that feels necessary. I'd prefer to have as few kits as possible (for now at least) to keep this simple. We can tackle text v. icon mods and such debates later on. Find the newest version attached. I'm still waiting for a response from id Software/Bethesda about IP and trademark issues that might arise. I heard Valve was A-OK with SA Carbon incorporating the Half Life Lambda logo in the set, hopefully id Software will be as understanding, especially with Quake Champions coming up. I'm also waiting for Uniqey to respond about custom colors aside from their usual options. I think it is possible (at least GMK Yuri had some IIRC) but not certain how much it affects the prices. EDIT: I did check some trademark database and the word "Strogg" was being applied for by id Software ages ago for marketing stuff and such, but they were abandoned for some reason. Not sure how that fact changes things though. Really like this now the grey space bars have been added. If this gets in to GB status I'll def be interested. Have not acquainted myself with the XT layout. But yes, I target US ANSI with "US ISO" compatibility in the base kit. An Intl kit will happen if enough people are interested. I'll check out some more info about the XT layout (but looks like a good target considering if it takes only a few keys as you state). There are so many keys in the current "basekit" draft so I can add that one and see if something can be removed. Thanks for the pointer! Yeah I thought that the turquoise spacebar was a nice thing, but in the end it did become a bit too sparky with it. 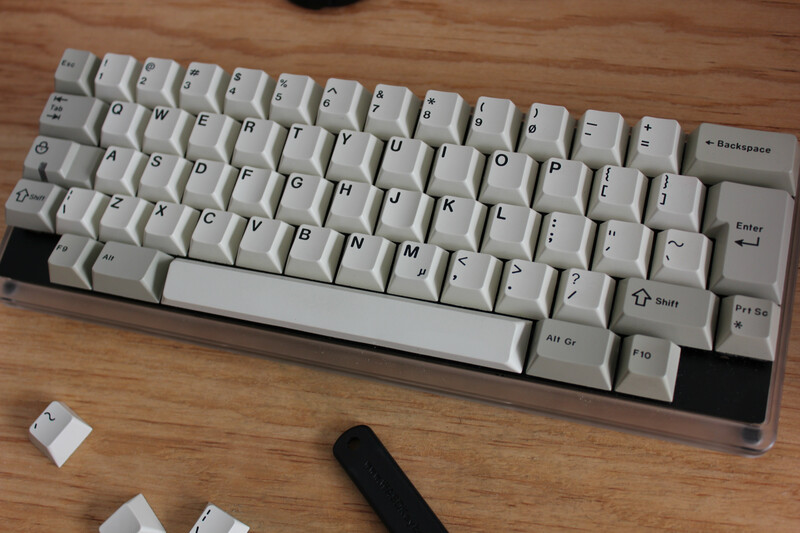 I want to offer those in a spacebar kit though (if the price does not get too high). Good to hear I got you interested. That looks fantastic. I'd definitely be down for one set. Uniqey has let me know today that custom colors are a go if we get 250 orders for a 104-key basekit, will probably get a more definite quote after I manage to get the sets themselves more finished. I'm still waiting for id Software to respond regarding copyrights and such. Might need to find some person who I can contact directly via email or phone if this drags on. The biggest issue with copyright would probably be the naming of this set and possible novelties that are based on artwork that is copyrighted. I absolutely love the alphas. Im not too keen on the modifiers but honestly I would consider buying a set for the alphas alone. I've been looking at my drafts and the modifiers do need some adjusting in my opinion too. Might be the brown color (I've always thought brown was a difficult one to make work). But yeah the alphas are set right now, most responses seem to be content with those. Been playing around with the brown modifiers, trying to make them better based on feedback and my eyes. I want to keep the base color for the modifiers earthy and a tad rusty, but the color brown is a tad difficult to work with. A concern I have with this draft is that the modifiers and the alphas are too similar so it would not make even sense to have two different base colors for them. I started perusing Pantone colors as GMK likes to receive custom color codes as Pantone colors (which makes things much simpler from what I've heard). This results in some tone and hue changes in the current planned colors, but nothing super-duper tragic. Mainly I'm concerned that the alphas become too different compared to the current state. Will update soonish. The alphas have a blue hue (basic color) while the mods have a red hue, I think you should try to choose a mod color with blue hue to match the alphas better, otherwise the combination is harder on the eyes, due to the basic hues of both colors clashes in between. Current version has warm hue on both alphas and modifiers, the base color on the alphas looks bluish probably because of the legends and the more intense saturation of the modifiers. Unless you meant the legends which are of course entirely opposite. I'll try and see how some more combinations work. Thanks for the pointer. Started planning basic novelties. Included right now are the Quake game logos (with Quake 1 and Champions being the same), and the Strogg Military Insignia. I originally wanted to add some red to resemble the bloody ways of the Strogg, and the novelties might be a good way to introduce some red into the mix (kinda like GMK Nautilus novelties do). I will have to see about whether I want to include all the Quake logos or if I should drop some. A solid simplification would be to drop everything other than the Quake 1/Champions logo (this would allow a bigger compatibility kit similar to SA Carbon's Half Life Lambda novelties kit). I also chose some baseline Pantone values for the colors (with the novelties red being the trustworthy GMK V1 color). Still trying to find a proper combo for the alphas and modifiers which would work together. Maybe I'm getting a bit blind on my own work but the combo of a cool and warm looks OK-ish right now. Might have to pause working on the colors for a small while and return with a fresher vision. Attached is a simple table with colors and novelties. EDIT: Hmm Photoshop still being an ******* about colors. Need to check whether there is some thing with Windows or web browsers that make the issue visible. The contrast and saturation is a bit messed in the attached image. EDIT2: Now the colors seem to work better. Need to make a clearer note about how I saved the image for future reference. Blood, lead, and rust. I love it so far, definitely interested. I thought the original colors were perfect. Might be my monitor, but the new version looks kinda pukey and desaturated. I'd probably skip the set if it released in its current form. The skull is cool. Could probably drop the Quake 2 and 3 logos though. I see. I have the old draft with more saturation still around so I can go back if it seems like a better choice, need to "pantonise" those colors though. I was hoping to keep the Q2 logo as the Strogg from that game are the main inspiration. Quake 3 was a different setting altogether so that might be cut if the kit would become too big, yes. Quake 4 is similar to Quake 1 so will have to see if that is "worth" keeping around.